October 1, 2016 Victoria, BC ( ISN ) – The Westshore Rebels scored 24 points in the 2nd half to comeback to beat the visiting fifth place Kamloops Broncos 34-25 to close out the regular season 8-1-1, and propel themselves into the British Columbia Football Conference playoffs for the first time since 2012. Anecdotally, it would be about two games into the season when head coach JC Boice was overheard exalting a staff member. “ I’m a mechanical engineer. I can build anything!” No more true to the statement was that than what he has been able to do with the Rebels this season, building a team to take the organization from cellar to penthouse in the Conference in an amazing, turn around year. After finishing last season 2-8, the Rebels have righted their ship this year to sail into the post season sitting in top place, earning home field advantage in the process. Rebels running back Jamel Lyles, in helping lift his team to victory in the final game of the regular season, would set a new BCFC single season record for total yards rushed, eclipsing past BCFC players and now current CFL players, Andrew Harris and Greg Morris who both played their junior football on Vancouver Island. The Rebels were definitely not taking the Broncos for granted despite lack of meaning to the final game of the regular season. In their last meeting, the Broncos would give the Rebels everything they could handle until Nathaniel Pinto turned the tide late to spark his team to a game four, 45-32 win. Westhshore would dust off QB Devon Hallum, acquired one month ago, filling the void left by the early departure of QB Scott Borden Jr. Giving starter Ashton MacKinnon the night off, Devon would take the snap under center against his Bronco counterpart in Colby Henkel. The Rebels would open the scoring early in the first quarter, taking a 3-0 lead on Kyle Clarke’s field goal to jump out in front. The Broncos would find their offensive pace first, marching the ball down to the Rebel’s 5 yard line only to turn over the rain-slicked ball on a fumble much to the relief of the Westshore defensive line. Equal to the task, Westshore would also find trouble holding the ball, fumbling the ball in the end zone and concede Bronco touch back. A Henkel strike over the middle to Bronco’s Colin Mather, camped at the Rebels’s twenty-yard line, and a nifty piece of running would result in the games first TD after Mather would bounce off tackles and into the end zone for the major to take a 9-3 lead. 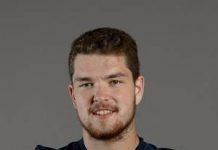 Westshore penalties, and a balanced offensive attack would see the Broncos build to their lead with nine minutes remaining in the half as Henkel would hook up with receiver Colin Mather for his second touchdown of the game to take a 16-3 lead. Rebel’s QB Hallum would find his touch for the ball late, chucking the ball from eighteen yards out, finding Westshore’s clutch catcher Nathaniel Pinto in the endzone on an a remarkable over the shoulder catch to beat Bronco’s DB Jordan Angove to the ball with just 50 seconds in the half in a much needed score to sway momentum in the direction of the home side to pull within six with the score 16-10 going into the locker room. For Pinto, that was his eight TD of the year, averaging 30 yards per reception. Rebels RB Jamel Lyles, needing 147 yards in the game to become the single season rushing record holder would be held to just 40 yards in the first half, but enough to surpass VI Raider alumni Andrew Harris in the record books. The Rebels defensive line would do what they have done virtually all season, rise up. The Westshore D-line would hold the Broncos off the board in the third quarter, marked by an impressive defensive stance that saw the pressured Bronco’s offensive line go three and out on three consecutive attempts at the house. With that effort, the Rebels would start to roll, backing up the Bronco’s defense seemingly at will. Rebels QB Hallums would orchestrate his offense down field for two TD’s in the quarter. Hallums would call his own number from one yard out on a QB keeper with 10 minutes remaining scoring his first of two TD’s n the night. Hallums, from eleven yards, out would find receiver Brandon Ihanza in the end zone with five minutes remaining to set the Broncos back on their heels taking a 24-16 lead. Kyle Clarke would add his second field goal of the game to end the third quarter 27-16. In what may have been the play of the game, the Rebels would fake a field goal attempt in the third quarter, throwing the ball out to a diving 6’4”, 290 lb DL Kent Hicks. The ball, looking like it was out of reach, would be snatched out of the air at the last moment in an unbelievable, athletic effort by Hicks to extend the Rebel’s play. Jamel Lyles, needing only four yards to surpass record holder Matt Medwick’s rushing record to start the fourth quarter, would run the longest for yards of his career as two consecutive Rebels penalties would call back Lyle’s runs of twenty and thirty yards, temporarily negating the record setting attempt. Lyles would eventually set the record, passing former Westshore Rebel and now Saskatchewan Rough Rider Greg Morris on the way to the record books. The game still within reach for the Bronco’s, stand-in QB Ryan Derksen would make a game of it, passing for a four yard TD strike after the Rebels would concede a safety as a result of Bronco defensive pressure would back up the Rebels into their own end zone. The Broncos would pull to within two points 27-25 with a mere 1:24 remaining. After a short Bronco’s kick off, Hallums would give the rock to Rebels RB Trey Campbell at midfield. Campbell would break tackles on his way downfield, scampering to Kamloops’ eight-yard line. With time running out, Hallum’s would take the bootleg, outrunning the Bronco’s defenders to the far post for his second, and more importantly, the winning TD to give his team a tough 34-27 victory. The Westshore Rebels, looking to be the first Victoria team to take the Canadian Bowl National football title, will need to win their next two games to punch their ticket to the national championship. They will first have to contend with a surging VI Raider club in the BCFC semi-finals to be held at Westhills October 15th, and then meet either Langley Rams or Okanagan Sun for the provincial championship Cullen Cup. On an alternating format, the Canadian championship will be played in BC this year on the home field of the Cullen Cup champion.